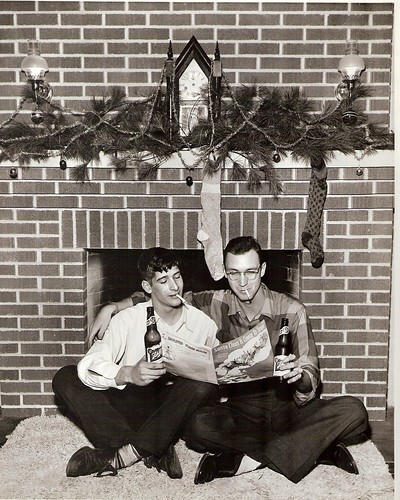 That's my Papa there on the left. If you don't think this is one of the best pictures ever, you are wrong. second of all, keep posting christmas pictures like this and it may erase all the ugly associations i have of christmas and delilah's soft-rock holiday hits. third of all, i'm going to pop a beer open before 5:00 today. in memory. Casablanca - Delilah: All depressing, all the time. I'm pretty sure that's what is going on her new business cards. That is a FABULOUS photo!! I love it! Thanks for sharing! What a fantastic photo! And you can honestly see the resemblance between your papa and your avatar picture. Corinne-- My mom always tells me that the first thing she said when I was born and she saw me was, "She looks just like my dad!" I don't look exactly like him anymore, but I am definitely his granddaughter. This is AWESOME defined. I would blow it up and hang it. Wow! That is a great picture. You are so fortunate to have something so cool; I have very few of my dad. Thanks for sharing; new to your blog, but I'm looking forward to reading more. I agree: WHY don't men look like that anymore? I would definitely enlarge this and hang it somewhere I could see it everyday. Haha- that picture is AMAZING! ;) Looking forward to getting to know you here and at Cupcake '10! Erin, that is a wonderful picture, and I agree, you resemble your grandpa. It's a great tribute to him. Merry Christmas! Um, yeah, umkay...totally the best picture! Christmas cards. Or, heck, you could do a whole holiday decorating theme around it...ornaments, garland, a mantle picture...That is one fabulous photo! what a wonderful photo. so wonderful. my papaw passed away this weekend and selfishly i just hurt that we didn't have the kind of relationship like you did w/ your papa. geography made that hard. but, he did always have frozen reece's cups for us anytime. and those little memories i'll always treasure. That is a cool picture. Classic. I like it. Old photos like this have such mysticism to them that I often wonder if we're doing something wrong or somehow diluting the magic by taking hundreds of pictures of our kids all the time. Then I remember that the pictures are only of our kids. Hardly anyone takes pictures of us. So maybe the magic will be there, like this, for our kids and their kids and their kids.